I would like to wish you all a Very Happy New Year! I hope you have a wonderful 2016, filled with Health, Happiness, and Love! Thanks for sticking around my blog, commenting and just encouraging me to keep going with it. To celebrate welcoming 2016 I’m having a Sale at the Etsy shop – use coupon code “NY2016” for 10% any purchase $5 or more. So go on, start your New Year off with some stress relieving coloring pages, instantly available for download or stock up on some Sheepy Goodness. This year I’ll be working on my Art – I’m taking a Jane Davenport Workshop on Drawing and Painting Beautiful Faces….I’m so enjoying branching out to using color and incorporating Zentangle with it. If you have always wanted to unlock your talent for drawing, Jane’s workshops are amazing! 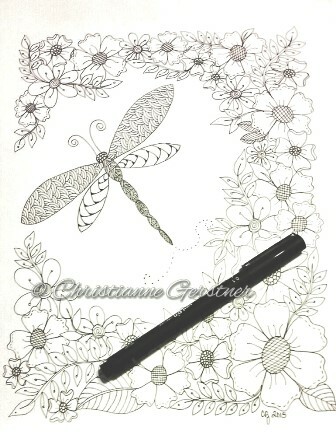 I’m also hoping to be able to put together a schedule with Zentangle classes. It’s been hard to plan too far ahead lately. My Youtube channel has grown significantly since I posted my How to Make Gems for Zentangle Video, so thank you for taking the time to watch! The end of this year has seen me getting back to my Midori Travelers Notebook, and incorporating Art Journaling – All those scrapbook supplies that I have and finally I have a way to incorporate it into my daily journaling. I’m super excited to add a Chic Sparrow Creme Brulee to my notebooks this year and I can’t wait till it arrives! I’m thinking I’ll do a video flip through of my December insert with all the tip-in’s and photos – this opened a whole new world of journaling for me and has become part of my daily practice. The end of 2015 I’ve not only added a Canon Selphy to my artjournaling equipment, but I was given a little Polaroid Zip for Christmas – which is awesome, portable and I love it! You can follow my Art Journal and other adventures over on Instagram. I’ve discovered a few very talented women over on Youtube that have really inspired me this year. Ali Brown, who has a wonderful channel with so much inspiration and enthusiasm for journaling, art and photography – her videos are just so much fun to watch. Jennifer Harvey aka Chic Sparrow has some amazing video’s showcasing her gorgeous notebooks and her love of art – check out her watercolor blending video. And last, but certainly not least, my Daughter-in-law, Jesscrafts, has a Channel chock full of all you’d ever need to know about cardmaking, stamping, copics, a multitude of techniques and crafty amazingness. Go check them all out – I dare you not to be inspired! Tell me what you inspired you in 2015! There are all these beautiful Zentangle Inspired works appearing in the groups on FB and it’s all about these wonderful “Gems” I first saw the gems made by Kae Yoshino, and the tutorials on that blog. A few members of my Facebook group were asking for a video – I searched and just couldn’t find one so….I made a quick one. Keep in mind that how I make the gems is just one of the techniques out there and there are many. I hope it helps. There is also a new ebook from Eni Oken – you can find it on her blog. 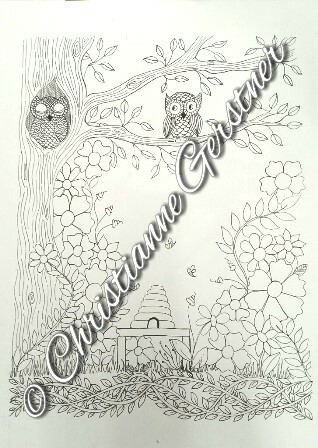 My 5th and probably, favorite coloring page just went live in my Etsy shop…..
Adorable Owls, with pretty Botanical’s and a little hint of Summer Time Bee’s all in an instant PDF you can print out on your choice of paper and start coloring however you like. 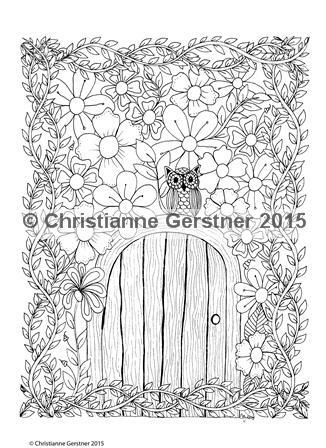 You can even add some tangles if coloring isn’t your thing. Your PDF will print out without the center watermark. I’d love to see this once you’ve colored it in, so be sure to let me know! Next time you read this blog….I’m hoping to have become a CZT! Because commenter Barb asked……Gnome Home, complete with guardian Owl is now available for instant Download. 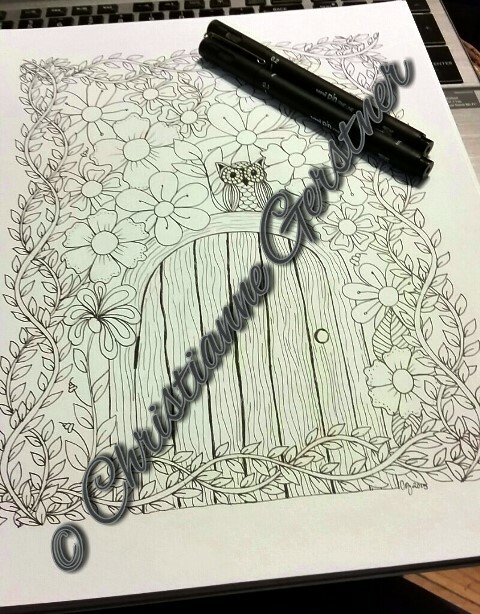 I’m so excited to be able to offer my work as coloring pages and I would be really thrilled to see how they’re getting colored in, so please let me know if you do! And thanks for the request, Barb! 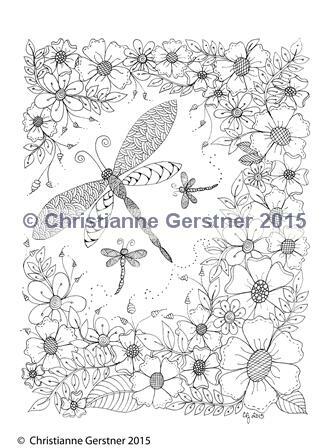 Dragonfly Coloring Page Available Now! Now available for instant download…. This time next week, my friend Karen and I will be on a Road-Trip to Providence, Rhode Island to attend the CZT Seminar #20! Soooooo excited. We have been waiting since November when we signed up and it seemed so far away then. I’ll be really thrilled to add the “CZT” after my name soon! If you had to choose – which one would you like to see uploaded into my etsy shop first? They will be available in PDF format, which seems to be universally available, priced at $1.50 each. 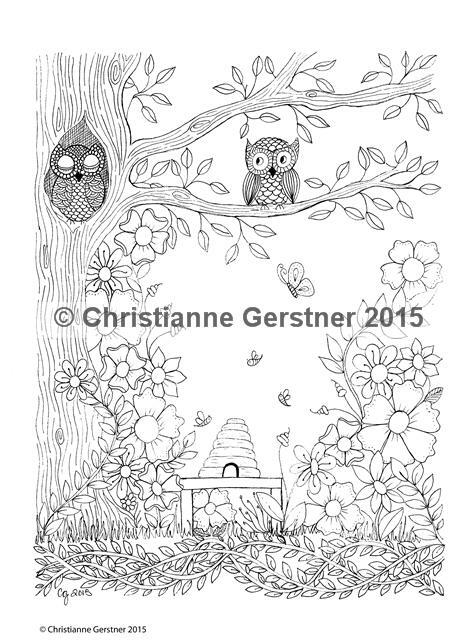 Instantly downloadable so you can get coloring or filling with tangle patterns right away!